This is a great way to add spice and flavor to your food storage. Everything will taste better with the proper seasoning. We have ordered bulk spices for years and have always been thrilled with their high quality and exceptional flavor. The spice blends are fantastic—our favorites are the taco seasoning and the chili blend! These herbs are wonderfully fresh and much less expensive by the pound than are those on the grocery store shelf! If there is a favorite spice you are not seeing, contact me—chances are, I can get it for you! These spices store well on the shelf. My favorite containers are pint and quart canning jars—some of the spices require gallon-size containers! These nuts and seeds are so fresh! They are available in all sorts of sizes and varieties. Purchased in bulk, they're a much better deal! We have some organic nuts and seeds available as well. Nuts and seeds are not suited for long-term storage but do great for several years in the freezer. So many of these items are so good for you, full of nutrients to keep you healthy and full of energy. Try them out. They make a great and healthy snack! Looking for Chia Seeds—the new super seed? You'll find it here. These are easy to use: they can be sprouted, added to smoothies, hot cereal and granola, or even made into a delicious raw-fruit jam. They're loaded with Omega 3,6, and 9 and help your body maintain hydration during high-impact sports or heavy activity. 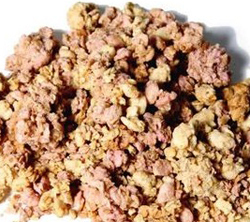 These granolas have good, mostly organic ingredients. Nothing you can't read or pronounce! Sweetened with molbuttes and evaporated cane juice, they're a great choice for a healthy breakfast or snack. Our very favorites are the French Vanilla Almond, Cherry Vanilla, and Wild Blueberry Flax. They have an unusually light and crunchy texture kids LOVE! 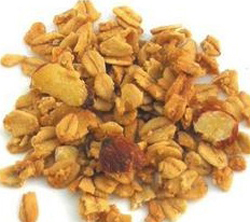 A sweet, vanilla-flavored granola with almonds. 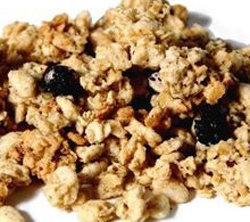 Naturally sweet granola with blueberries and flax seed. 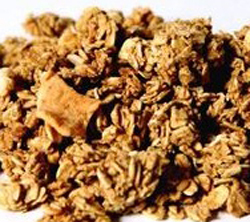 A delightful cereal made with oat flakes, dried fruit, nuts, coconut, and sunflower seeds. 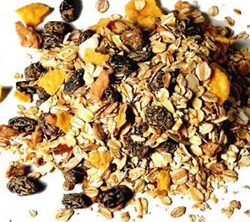 A fruity granola blend with apples. 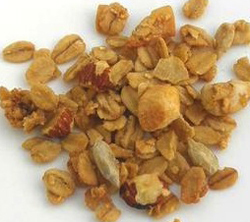 A maple-sweetened granola with almonds. A healthy way to start your day! 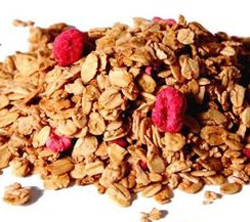 A berry delicious granola sweetened with honey and dried raspberries. 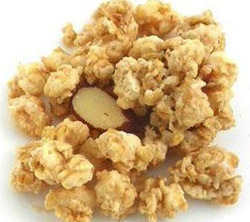 The nuttiest of granolas, made with almonds, cashews, walnuts and sesame seeds! 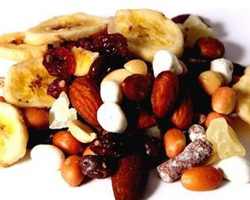 A great variety of trail mixes made fresh by the same company that provides us with our ultra-fresh seeds, nuts and dried fruits. 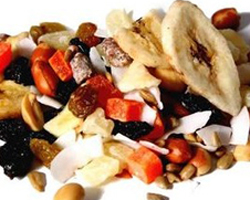 A satisfying blend of pineapple, papaya, banana chips, oat dates, coconut, raisins, almonds, sunflower seeds, and peanuts. Defy your taste buds with this rugged combination of almonds, cranberries, pineapple, sunflower seeds, peanuts, and raisins coated with chocolate and yogurt. 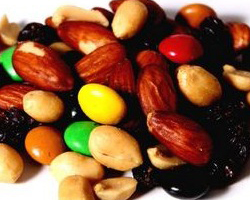 The original trail mix filled with fresh roasted-salted almonds and peanuts, sweet raisins, and the perfect amount of chocolate. 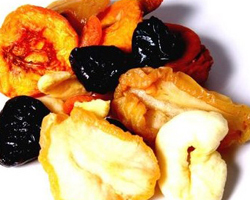 A dried fruit cocktail of apples, peaches, pears, nectarines, apricots, and prunes. 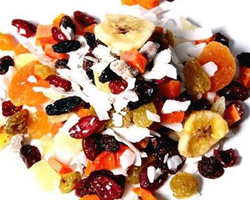 A tropical fruit medley of pineapple, papaya, coconut, mango, dates, cranberries, apricots, bananas and raisins. This tastes so good you will be swinging from the trees! 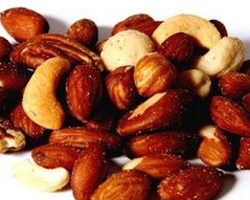 A roasted-salted combination of the favorite nuts: almonds, Brazil nuts, macadamias, cashews, and pecans. A luxurious necessity for your snack cupboard. If you're going to have a treat, isn't it nice to know that at the heart of your snack are great ingredients like nuts and dried fruits? Most of these candies start out as fruits and nuts that are then tossed in chocolate or yogurt topping, butter toffee or cinnamon toffee, or other yummy concoctions! The chocolate coating on these is top-quality—never waxy! These are a great way to snack!